There is a lot happening about evapotranspiration (ET) at the moment, and during 2019 I will be involved in several activities related to evapotranspiration measurement and theory (see this basic USGS page about ET, where I also got the image left). See this GEWEX article (p.5) from March 2019 entitled "Current Challenges in Evapotranspiration Determination" I've co-authored about ET. In October 2019 I will be co-organising a GEWEX cross-cutting meeting Determining Evaporation led by Prof. Joan Cuxart to take place in Sydney, Australia. 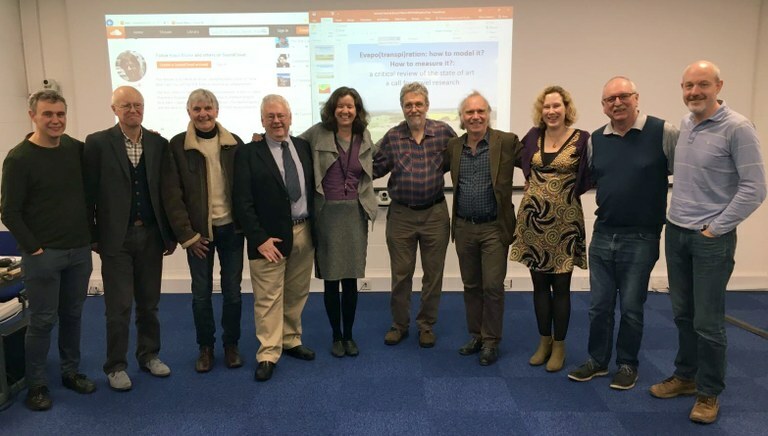 Prof. Henk de Bruin visited CEH Wallingford on 8th March 2019 and gave a wide-ranging talk entitled Evapo(transpi)ration: How to model it? How to measure it? A critical review of the state of the art and a call for novel research. The seminar attracted several senior hydrologists and micro-meteorologists from pre-CEH days. CEH article in The Grapevine is here and the slides and audio are here (including the energy balance closure blues!). Photo: L-R: Chris Taylor, John Gash, Colin Lloyd, Jim Shuttleworth, Eleanor Blyth, Henk de Bruin, Richard Harding, Anne Verhoef , Jim Wallace, Jonathan Evans.